Our mission is to enhance the cultural life of Ithaca and the Finger Lakes by preserving, operating and promoting the historic State Theatre as an active venue for national, international and community performances and programming. This organization is also committed to being this community’s center of performing arts activity, as well as a cornerstone of downtown Ithaca’s economic revitalization. During the Summer of 2015, our primary restroom facilities were completely renovated. This has nearly doubled the number of fixtures and tripled the amount of hand washing stations. Now you can spend less time waiting in line and more time enjoying the show! In 2010, major upgrades were completed to the stage and fly-gallery. A $92,000 rigging project added 13 counterweight line sets to the existing system allowing greater programming options and a more professional production space. In 2011, a significant portion of the damaged plaster that was highly visible throughout the interior of the theatre was carefully repaired and repainted, helping to bring the theatre back to the original grandeur from when it first opened in 1928. In 2012, a local foundation funded the purchase of a new digital movie projector, allowing us to bring Classic Movies back to The State Theatre! Since then, our Classic Film Series has added over a dozen vents to our calendar each season, filling up nights in which the theatre would otherwise be dark. In 2014, upgrades were made to our backstage and artist hospitality area, providing a more comfortable, relaxing space for our performers before and after their performances. The entire front entrance, including the plaster ceiling under the marquee, has been renovated, and many other improvements have been made to the lobby, including the repainting of all of the wood beams throughout. With over 3,000 light bulbs throughout the building, many have been converted to light-emitting diode (LED) technology. Additionally, the installation of new satellite lighting stations has helped the theatre become significantly more energy efficient. The tiny light bulbs in the ceiling of the theatre have been repaired and replaced, so once again our “stars” can come out at night. An insulated load-in door was added to the stage to seal a major air leak, ensuring an ambient stage temperature during performances and saving significant money on energy. A new handicap accessible drinking fountain was installed, giving all of our patrons access to free drinking water. Many of these projects would not have been possible without substantial community support. Other projects that we are considering for the future include lobby expansion, creating more flexible seating, replacing the stage and the installation of a new air cooling system which would allow us to increase our programming during the hot summer months. As long as we continue to receive support from this community members like you, The State Theatre will remain a vital fixture in Tompkins County’s arts landscape, allowing us to continue to bring world class talent to the Ithaca community in a safe and beautiful environment. Since 1928, The State Theatre of Ithaca has served as one of the most significant venues for performing arts in the Finger Lakes region. With its 1,600-seat capacity, it has long been the largest venue of its kind in Ithaca, New York. According to the History Center of Tompkins County, downtown Ithaca once boasted seven grand theaters, including the Lyceum, the Crescent, and the Strand. A longstanding community destination for Ithacans and surrounding residents, The State Theatre is the last remaining historic performing arts theatre in all of Tompkins County. The building dates back to 1915. Designed by local architect Henry N. Hinckley, it was originally an auto garage and dealership, specializing in Studebakers. In the mid 20’s, two Cornell Alumni, Lewis Henry ’09 and A.F. McCann, created Cornell Theatres. Inc. In 1926, Cornell Theatres, Inc. purchased this building and hired celebrated theatre architect Victor Rigaumont to design and oversee the transformation of the garage and showroom into an atmospheric cinema and vaudeville palace. Rigaumont incorporated elements of the Moorish and Renaissance Revival Styles and the Collegiate Gothic symbolism of their alma matter to create a magical haven for theatre and moviegoers. Opening night on December 6, 1928 was a memorable and entertaining spectacle featuring Paul Tremaine and his Aristocrats of Modern Music. The show promised “21 Peppy, Snappy Entertainers” and admission cost 50 cents. The State Theatre flourished as a premier entertainment venue and was a source of great pride to Tompkins County residents for many decades. Beginning with vaudeville, the theater has evolved with the times. When movies became more popular in the early 1930s, the theater thrived primarily as a cinema house. After World War II, with the advent of television and suburban movie houses, downtown cinema palaces like the State struggled. To adapt, the owners added a second movie screen in 1976, dividing the balcony from the main house. In 1977, the theatre screened Star Wars, and boasts all forms of live entertainment today. When the movie business alone could no longer support the building, the owner considered demolition. In the mid-90’s, a major infusion of community volunteerism and seed money from the Finger Lakes GrassRoots Festival of Music and Dance allowed for the removal of the balcony wall and a return to theatrical programming. If you look up from the front of the balcony, you can still see a visible line where this dividing wall met the ceiling. For three years, the Ithaca Performing Arts Center (IPAC) produced a broad range of shows, from local theater troupes to world–renowned musicians and touring Broadway shows. Lacking adequate capital, IPAC was unable to maintain the aging infrastructure and the building was eventually deemed unsafe to occupy. The tenure of IPAC, however, proved that there was a demand for larger theatre-sized events as long as the venue could be kept open with additional community support. On May 5th 1998, Historic Ithaca acquired the building and applied its expertise in preservation to revitalize the structure. A new roof (with thermal insulation!) was installed, historic plasterwork was stabilized and repaired, lighting and electrical systems were updated, and the organization learned how to run a theatre. Strong community support bolstered the first phase of the project and secured desperately needed funding from municipal, foundation and private donors. In 1999, the American Institute of Architects recognized the State Theatre as one of the 60 Most Significant Architectural Landmarks in New York State. The building was added to The National Register of Historic Places a few years later. In the spring of 2009, The State Theatre of Ithaca, Inc., a newly formed 501(c)(3) not-for-profit organization, purchased the State Theatre from Historic Ithaca. This allowed Historic Ithaca to return to its core mission of promoting architectural preservation programs and services in the Ithaca community. As the caretakers of this beautiful building, we take great pride in the architectural genius, outstanding acoustics, and exquisite ornamentation that can be found throughout the hall. We are also extremely grateful to Historic Ithaca, IPAC and all the other people and organizations that have helped shepherd this building. Without them, this community gem would have been demolished many years ago. Since taking over in 2009, this organization has invested over $1 million into this building. The primary restrooms on the balcony level were completely renovated during the summer of 2015 allowing us to increase capacity while discovering some cost-savings from installing more efficient fixtures. If you’ve attended events here prior to 2015, we’re confident that you’ll agree that the new restrooms are a huge improvement! This past summer, we improved the quality of experience for visitors to the State Theatre, particularly those who require greater accessibility to our venue. Prior to this season, only five of our seats were ADA compliant. We have now increased that number to 13 seats. The completion of this project means that we have an even more inclusive environment and we will continue to fulfill our mission of enhancing the visitor experience here while preserving our historic space. In addition to our restroom renovation and accessibility project, there are dozens of other major repairs and renovations that have been completed behind-the-scenes, helping to ensure a safe, comfortable experience at The State Theatre. Future projects are planned to increase the efficiency and enjoyment of this building even more. If you would like to get involved with any of these projects, please let us know. 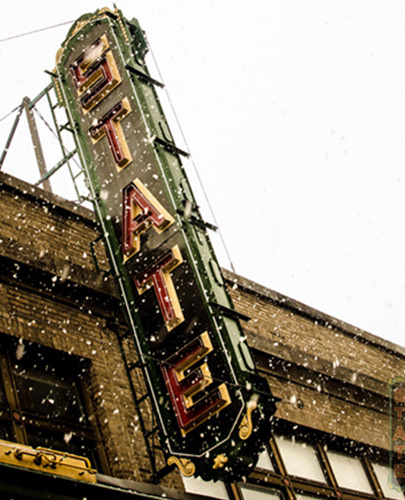 The State Theatre helps Ithaca define its own traditions and identity through shared cultural experience. We always welcome your thoughts and will continue to rely upon your support to ensure that the theatre provides this community with the finest performances, venue, and patron experience possible. Thank you for your patronage. We look forward to seeing you as often as possible this season and for many years to come! Doug Levine has served as the Executive Director of State Theatre of Ithaca, Inc. since the summer of 2009 and manages the theatre’s day-to-day operations with a strong focus on development and oversight of STI staff. Prior to joining The State Theatre, Doug enjoyed five years at The Tompkins County Chamber of Commerce as the Director of Membership, Public Relations and Special Events. He received his Master's degree in Business Administration from Ithaca College in 2004 and his Bachelor of Science from that same institution in 1998. As Director of Operations, Jean Hubbell is responsible for overseeing all day-to-day operations of the theatre. She has a background hospitality management and has brought her steadfast work ethic to The State Theatre for over fifteen years in positions of increasing responsibility. Her current role includes oversight of the house manager/volunteer coordinator, back of house supervisor, custodial services, and part-time staff. She also handles all of the theatre’s bookkeeping, working closely with the Treasurer on the organization’s Board of Directors. After graduating from SUNY Fredonia in May 2015 with a BS in Music Business and BA in Philosophy, Rachel Grant worked at a radio station in Owego, NY producing commercials and imaging, as well as being the voice of the “Midday Show.” With a desire to expand her presence in the Music Industry, she became a Volunteer at the State in the Fall of 2015. She joined the State Theatre staff two years later, almost to the day, in September of 2017 as the Audience Service Manager. Rachel is now the Manager on site for all events and is responsible for overseeing the staff of dedicated volunteers that work every show collecting tickets, selling concessions, ushering, and in making the overall experience of patrons enjoyable – the same group of volunteers that got her involved in the Theatre in the first place! She has a passion for live music and those “big rock shows” and could not be happier being a part of the hard working team here at the State Theatre. Originally from Rochester, NY, Casey decided to call Ithaca home after graduating from Ithaca College in 2010. In 2012, Casey joined our dedicated staff at The State to manage the box office and now oversees marketing efforts for The State. Casey has been instrumental in developing State’s new marketing initiatives including establishing the M&T Bank and Ithaca Times Movie Series, overseeing the recently updated website and social media outlets, and promoting The State Community and Family shows. As Production Manager, Rob is responsible for coordinating lots of moving parts to make each show happen. A lifelong lover of the arts, he takes great pride in his work and in the State Theatre itself. From playing music with multiple bands, to repairing instruments, to live and studio audio engineering, Rob is deeply involved in all aspects of making music. “I love the joy that people get from seeing an artist they love and the look of awe when they walk into this venue. It makes all the hard work worthwhile." Mr. Gearhart is an Associate Dean in the Park School of Communications at Ithaca College, and has been an administrator, educator and media producer, as well as active community member, for over 30 years in Ithaca. He most currently represents Ithaca’s Third Ward on Common Council and has served on the Ithaca Yacht Club Board as Membership & Marketing Director after a long commitment to the Ithaca Festival Board (1993-2009) where he served as President twice – and as a result, claims to have sold more Ithaca Festival buttons than anyone! Besides serving as Secretary, Mr. Gearhart is also on The State Theatre’s Major Gifts Committee as well as the Facilities Committee. Mr. Bonn is a lifelong resident of Tompkins County. He has served locally on the boards of Ithaca Festival, Red Cross, and United Way. He currently is a board member for the Finger Lakes Tourism Alliance and was appointed to serve on the Erie Canal National Heritage Commission. Fred is the Regional Director for the Finger Lakes State Park system where he oversees 30 facilities across 10 counties. Fred has enjoyed shows at the State Theatre for decades and is excited to be involved in its' future. Ms. Yeoh is the Associate Controller for Cornell University. After graduating from Cornell, she was the operations manager of the Haunt where she developed her love of the vibrant music scene in Ithaca, and decided Ithaca was a great place to live! She began working at the Statler Hotel while completing her MBA at Johnson Graduate School of Management, and has since worked in various financial and administrative management roles at Cornell for the past 27 years. Mr. Ash is the Co-founder and consultant at multiple businesses in the fields of online medical education, hospitality, strategic planning and sustainable energy. He has worked in the online medical education field as a co-founder of Vertical Health for nearly 10 years, now focused primarily on business development and revenue growth for the company. In public service, Ethan has served on multiple non-profit boards including vice chair of the Tompkins County Tourism Board, and chair of the Agritourism Task force. Ethan is the Vice Chair of the Dryden Democratic committee with a seat on the county issues and strategic planning work force. In 2017, Ethan co-founded the Youth Entrepreneurship Market (YEM), providing Ithaca-area students with a series of business start-up courses and mentorship, concluding with a community market for the kids to pitch and sell their concepts to the public. Mr. Osadchey is Vice President/ General Manager of the Cayuga Radio Group, which is comprised of seven (7) local radio stations broadcasting in the Ithaca and surrounding Finger Lakes region. He brings 20+ years in advertising, marketing, media, and public relations experience to the board. Mr. Osadchey was born in Ithaca, graduated from Ithaca High School and Cornell University, and has successfully run various aspects of radio operations in Syracuse, Rochester, Buffalo, and Hartford, Connecticut in a variety of formats including operation of the Buffalo Bills Radio Network. Phillip Blackman is an Assistant Professor of Accounting and Business Law at Ithaca College. He graduated from UCLA Law with his Juris Doctor and a Masters in Law in Business Law and Taxation. Phil also earned a Ph.D. in Higher Education Administration from Penn State. Before pursuing a career in academia, Phil lived and worked in Los Angeles as a recording engineer and music producer. In that role, Phil worked with a wide variety of artists including Aaron Neville, David Crosby, Stevie Wonder, 311, Hole, The Fugees, Motley Crue, Macy Gray, and more. Phil still enjoys composing and recording music as well as astronomy and golf. He currently serves on the State Theatre’s Finance Committee. Ms. Dickinson is author of the nationally syndicated advice column, “Ask Amy,” which is read by an estimated 22 million people. Her memoir, “The Mighty Queens of Freeville” is a New York Times bestseller. She is also a panelist on the popular NPR comedy quiz show “Wait Wait, Don’t Tell Me.” A lifelong fan of the State Theater, she has appeared on its stage twice – as a guest of Michael Feldman’s “What Do You Know?” and in a surprise duet with musician Bobby McFerrin. Mr. Ferguson is the Executive Director of the Downtown Ithaca Alliance, a non-profit, tax exempt organization dedicated to sustaining downtown Ithaca as a community resource. He has been a driving force in the strategic plan for downtown Ithaca and has been instrumental in the development of two new City parking garages, the Seneca Place Hilton Garden Inn, the relocation of 380 Cornell University Employees into downtown Ithaca, the Gateway Commons and Gateway Plaza’s 4-acre mixed use office, retail, and residential site in downtown, and numerous other revitalization activities in downtown Ithaca. Mr. Ferguson also serves at the Chair of The State Theatre of Ithaca’s Strategic Planning Committee as well as the Nominating Committee. Katie Foley is the co-owner of the award winning food truck “Silo” and was named 2018 Entrepreneur of the Year by the Tompkins Chamber of Commerce for her business. Prior to Silo, Katie served in various leadership roles in the area of Development/Fundraising and not for profit management. She has served as the Director of Development at both Family & Children’s Service of Ithaca and Planned Parenthood of the Southern Finger Lakes and as well as Program Director of the Big Brothers Big Sisters Program at the Ithaca Youth Bureau. Katie has volunteered for a variety of not for profits and was recognized as 2015 Volunteer of the Year by the United Way of Tompkins County. Katie currently serves on the board of CFCU Community Credit Union, and is actively involved as a Fundraising Volunteer with the Edith B. Ford Memorial Library. Ms. Matychak is an associate of the Harris Beach Law Firm and practices in the Corporate and Commercial Real Estate Practice Groups and serves on the Financial Institutions and Capital Markets Industry Team. In the area of general corporate law, Ms. French counsels businesses on organizational matters, general business contracts, financial transactions, governmental compliance issues and mergers and acquisitions. She also structures entity formation and drafts operating agreements and by-laws. Ms. French is currently serving on The State Theatre’s Major Gifts and Facilities committees. She is also on the Board of Directors of the Franziska Racker Centers. Ms. Gutenberger is the Manager of Real Estate Operations for Cornell University. She is an architect and attorney and is the primary transaction person in the Real Estate Department. Additionally, she serves as the Department's construction project manager and deals with marketing issues surrounding Cornell's Business and Technology Park. Mr. Guttridge founded Brightworks Computer Consulting in 2004 as a one-man operation based in his dining room. John’s energy, technical expertise, and vision have developed Brightworks into a regional IT powerhouse with 15 employees and great potential for future growth. John has deeply involved himself in the ongoing redevelopment of downtown Ithaca. He serves on the Board of the Downtown Ithaca Alliance (where he chairs the Downtown Operations Committee) and is President of State Theater Foundation Board. He is also integral to the team of people that works to bring Wizarding Weekend to life. Wendy A. Marsh is a partner at Hancock Estabrook, and is the Chair of the Environmental & Land Use Planning Department. She was born and raised in Geneva, New York and currently resides there with her partner, David Linger. Ms. Marsh concentrates her legal practice in the environmental arena, as well as development law, representing small and large businesses, to assist them in achieving compliance with applicable environmental laws, as well as municipalities and developers to assist with various “right to build” issues for controversial projects. Prior to serving on The State Theatre’s Board, Ms. Marsh was involved with the Smith Opera House in Geneva for over ten years, serving as Chair of their Board of Directors while assisting them through significant construction projects funded by state grants. Ms. McCollister served two terms on Ithaca’s Common Council, devoting her time primarily to planning, zoning, economic development, and historic preservation issues. She was formerly director of external relations at the College of Architecture, Art & Planning at Cornell University, and later held a similar position at the Johnson Art Museum. Newly retired, she’s looking forward to spending more time on musical and artistic pursuits and engaging with the Ithaca community. Mr. Travis is an experienced real estate owner and developer. He owns several properties in downtown Ithaca and is committed to maintaining a vibrant, community owned, performing arts venue in downtown Ithaca. Mr. Travis is a devotee of the arts and a former filmmaker. He has served on the board of numerous local charities and besides serving as the President of The State Theatre’s Board of Directors, he is also the Chair of the organization’s Finance Committee as well as the Development Committee. To enhance the cultural life of Ithaca and the Finger Lakes by preserving, operating and promoting the historic State Theatre as an active venue for national, international and community performances and programming. Quality - We challenge ourselves at all times to do our work better, seeking the highest quality in all of the work that we do, with the finest performers and events, the best customer service, and the richest experiences for all of our patrons, volunteers, and supporters. Engagement - As our community’s largest living room, we are a forum for public engagement in the Arts, education, and community involvement and improvement. We celebrate the tremendous power of the communal experience. Responsibility - We are the stewards of our historic 1928 theatre, and as such we take great pride and care in preserving our home. We will use the resources entrusted to us in a responsible manner, and we will take seriously your confidence in us. We firmly believe that our work has enormous potential to make a difference. Fun - We will always remember that we’re in the entertainment business. If we wish to bring our patrons enjoyable experiences, our staff, volunteers and board should enjoy them too, and have fun in all that we do..